SourcePoint’s seventh annual Grandparents Day on Saturday gave children and their grandparents the chance to collaborate on some fun activities. “What’s that?” asked one of the attendees. “It’s rubber … I mean brains!” said one of the mad scientists. The scientists also taught the children how to make flubber, a rubbery slime made with glue and borax. “Their favorite thing was making flubber,” said Sue Frederick, a SourcePoint member who brought her two grandsons, Brayden and Nate Frankel, ages 7 and 9, respectively. Frederick said she had brought Nate the year before and they enjoyed themselves so much that they had to come back again with Brayden. The boys said they would be glad to come back next year. “He really liked the mad scientists,” said Carin Delfs, a member at SourcePoint who brought her grandson, Nevin Zerby, 7, to the event. Delfs said Zerby also enjoyed the water rockets, two-liter bottles half filled with water then placed on a bike pump and pumped full of air, which causes the bottle to rocket into the sky. The event also had a photo booth with souvenirs, water volleyball, a cake walk where the prizes were all related to the moon to commemorate the upcoming solar eclipse and a Take-It-Apart Table where children got a variety of tools and had the opportunity to completely disassemble several devices like a tape player or alarm clock. Karen McCreary said her 9-year-old grandson Ethan Brown really enjoyed taking the items apart and putting them back together. “This was our first year, but we’ll definitely come back next year,” McCreary said. The event was presented by Ohio Living Sarah Moore and Foot & Ankle Wellness Center and sponsored by Country Club Rehabilitation Campus, Parkside Village Senior Living, Delaware Speech & Hearing Center, Powell Senior Living, and Powell Assisted Living and Memory Care. 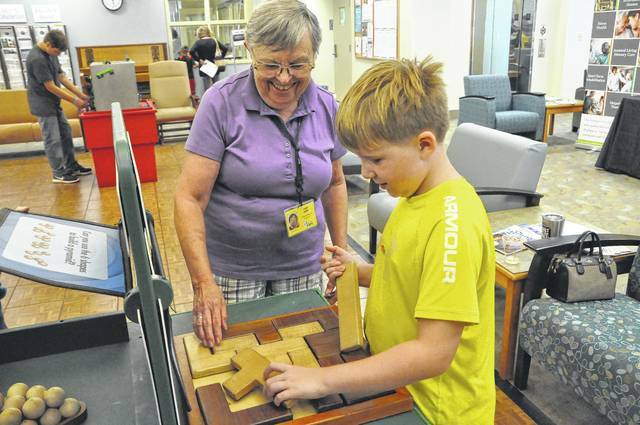 Carin Delfs helps her grandson, Nevin Zerby, with a COSI puzzle station during Grandparents Day Saturday morning.